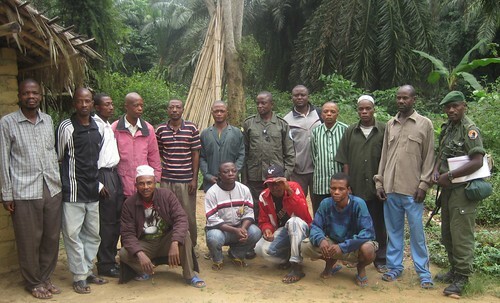 On the banks of the Luidjo, west from the village of Oluwo, the elders marked the trees and signed their agreement. 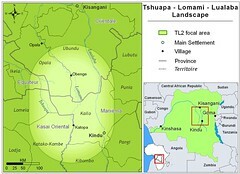 The Tambiko had immense traditional importance, but resulted in none of the written administrative documents needed to legitimize a future Lomami National Park. There were neither texts nor signatures, only drumming and songs and spit in the sand. It was through the Tambiko that the Bangengele and the Balanga granted part of their ancestral lands to a protected area. The chiefs gathered, but their calling forth the ancestors could not move the wheels of the provincial administration. Where was the written agreement? So, was it possible to maintain the original significance and still arrive at an official document? Would something as black and white as signatures on a statement be too definitive? Would the chiefs refuse? 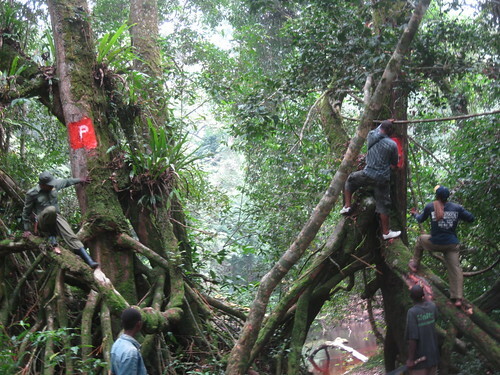 A team set out from Kindu in late July – they would find out. They planned to circumnavigate the southern part of the Reserve, to stop in all the major villages of the Balanga and Bangengele. The goal was to actually mark the reserve limits and to have the chiefs sign their agreement to those limits. 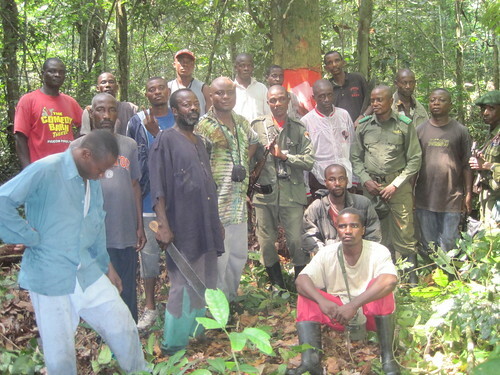 It was a team made up of provincial authorities, ethnic leaders, guards from the conservation agency (ICCN) and, at every stop, the chiefs from all surrounding villages. In all there were eight stops. 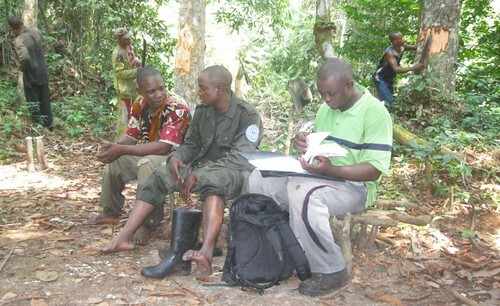 West of the village of Tshombe Kilima, the parks representative, Warden Dedieu, talks with the Chief of Oleke while Salumu prepares to record signatures and bark is cleared off several trees. The elders and chiefs from the villages near ChomeLome in the forest where the trees were marked and they signed. 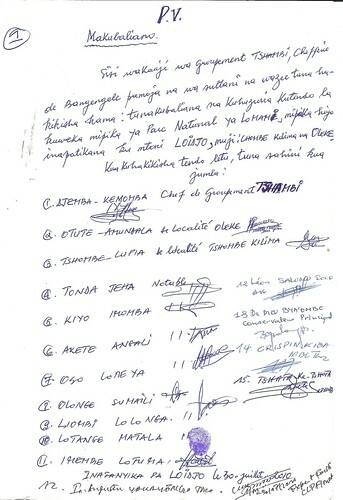 The Balanga authorities that signed. What was immediately clear was that as important as the signatures on paper were the signatures on the trees – the first step – carried the great significance. 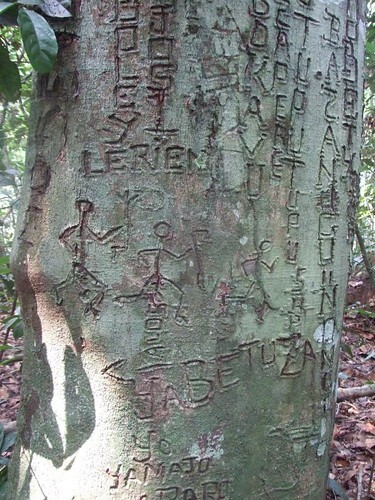 For many years travelers through the forest had left their signs on the trees…and in recent years many trees were riddled with the names of poachers. Now these latter would be replaced with the sign of the park. Messages in the bark of trees. 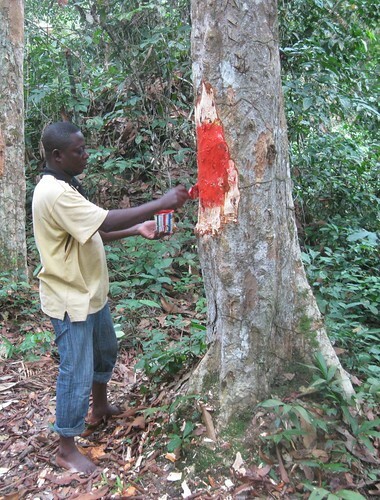 Leaving the marks on the trees west of Oluwo. The Land Tenure authority put his paint next to that of the village chiefs at ChomeLome. Very important for all the authorities to note, however, was the content of the discussion. The land could become park, BUT : What about the paths that crossed to the Lomami River, could they still use them? What about fishing rights within the future park? The birth of a park in the minds of the people and the changing traditions of a place is not a single series of signatures. It is many village meetings; it is discussion, negotiation, scratches in the bark of trees, song and spit in the sand. In TL2 the process is ongoing. One of nine pages of signature carried to the provincial assembly and on to the national capital. This entry was written by Terese Hart, posted on 2010-09-11 at 6:05 am, filed under About the project, Indigenous peoples. Bookmark the permalink. Follow any comments here with the RSS feed for this post. Post a comment or leave a trackback: Trackback URL.